Perfect location. Spacious and nicely furnished room. Very spacious apartment located centrally - 2 min away from the main square. Breakfast is not included but kitchen is well equipped. There are also various restaurant options from where to take breakfast. Reception was available throughout the day and once we requested extra towels and found them ready within the hour. It was very central less than a minutes walk to the main square and was very quiet considering. Keys were easy to pick up, price was great value for location & room was very tidy. The room was clean and well kept. Location was excellent for krakow sight seeing and is just 200 metres from the centre of the main square. Lock in a great price for Mikołajska 5 Apartments – rated 8.9 by recent guests! One of our best sellers in Krakow! Located in the heart of Kraków, Mikołajska 5 Apartments are 500 feet from the Main Market Square, with its historic Cloth Hall and St.Mary's Church. They offer accommodations with free Wi-Fi. 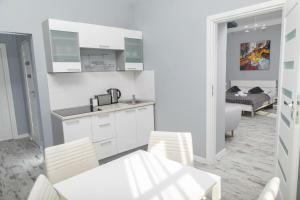 The apartments are classically furnished and decorated in modern style. They are located in a renovated historical building, and offer a view of the courtyard or the medieval Old Town streets. 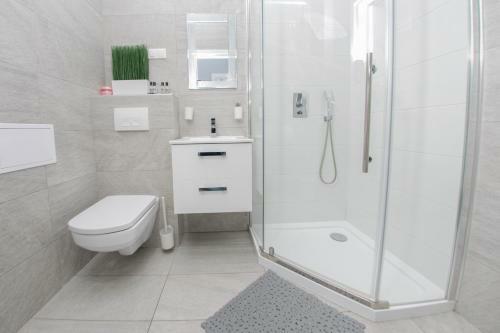 Each comes with a bathroom with a shower and a TV. Most come with a kichenette with an electric kettle, a toaster and complimentary tea and coffee. All come with hairdryers and towels. Mikołajska 5 Apartments are 2,800 feet from the Wawel Royal Castle and 0.6 mi from the historical Jewish Quarter of Kazimierz. Kraków Główny Train Station and Galeria Krakowska Shopping center are 2,450 feet away. 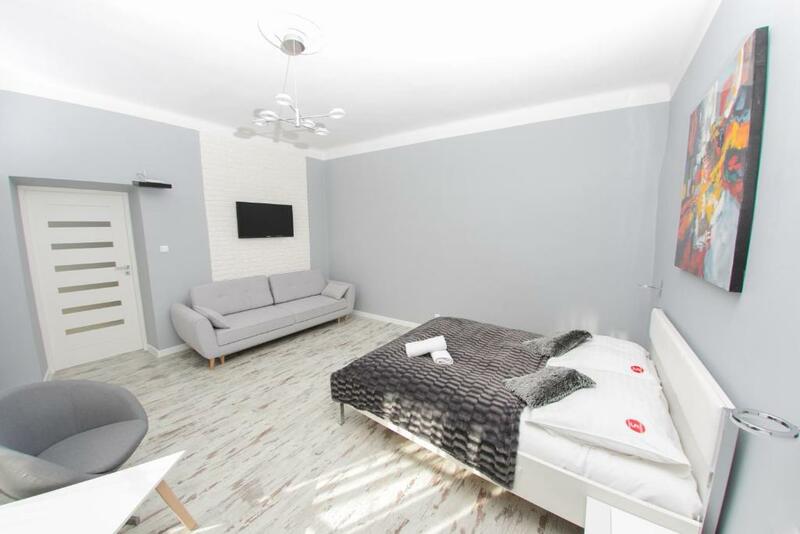 When would you like to stay at Mikołajska 5 Apartments? 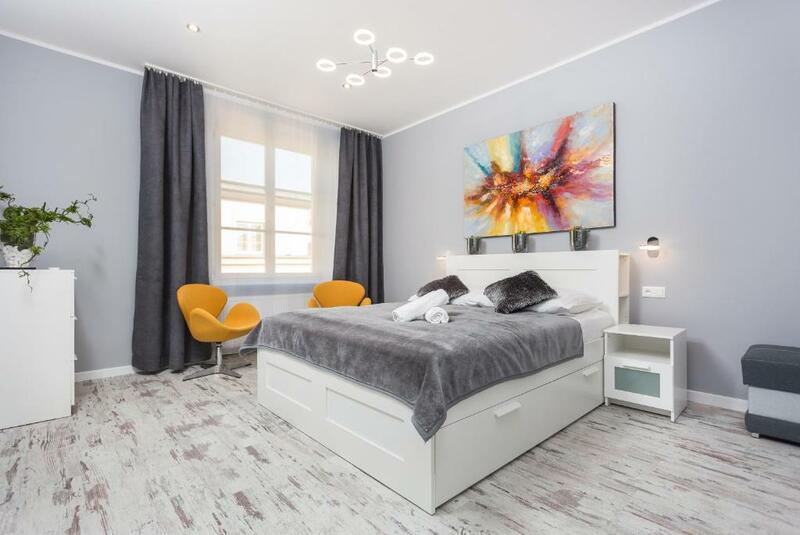 A more spacious colorful apartment with a TV, a bathroom and a kitchenette. Decorated with soothing shades of green, this apartment comes with a TV, a bathroom and a kitchenette. A more spacious apartment with a TV, a separate kitchenette and a private bathroom. It offers views of the city. A sofa bed can be amended to an extra bed for 2 guests. An apartment with a TV, a separate kitchenette and a private bathroom. It is decorated in the tones of blue. A more spacious apartment with a TV, a separate kitchenette and a private bathroom. An apartment with a TV and a private bathroom. It offers city views. Decorated in shades of gray, the apartment has its own bathroom, a fridge, microwave and TV. This 2nd floor apartment features a kitchen. It also has a TV. This 2nd floor apartment features a kitchen and a bathroom. It also has a TV. it is decorated in shades of soothing gray and vivid red. 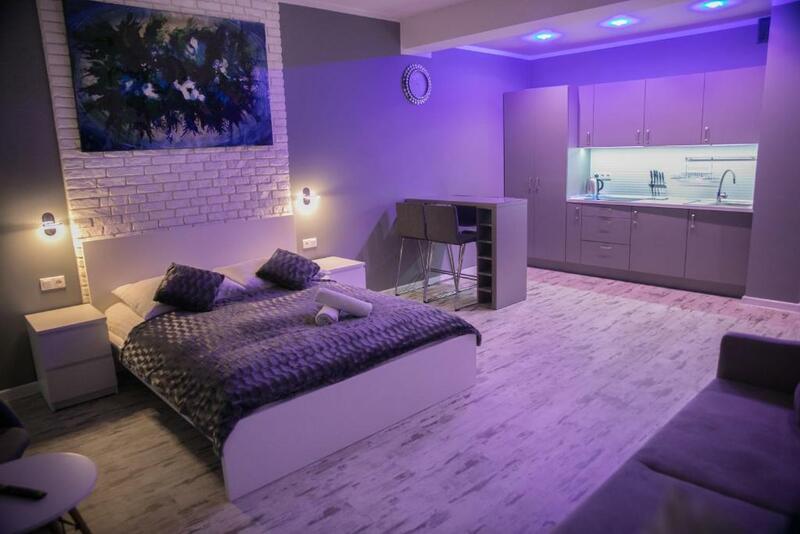 This apartment features a TV and iPod dock, as well as a sofa and microwave. This apartment features a private entrance. It also has a TV. This apartment has a kitchen and offers a city view. 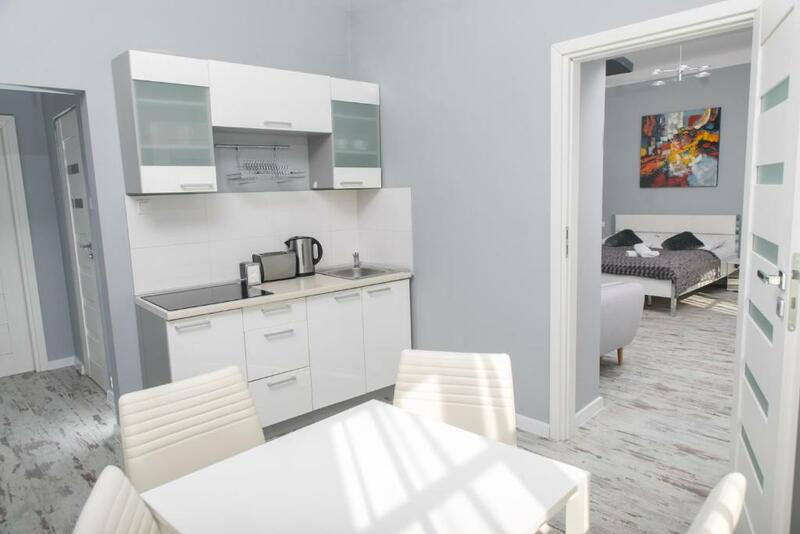 A comfortable studio apartment consisting of two independent rooms, with the possibility of accommodations for up to 6 people. It has a kitchenette, a separate bathroom with a shower and a separate toilet toilet. Decorated in a modern gray design with the addition of extravagant yellow. 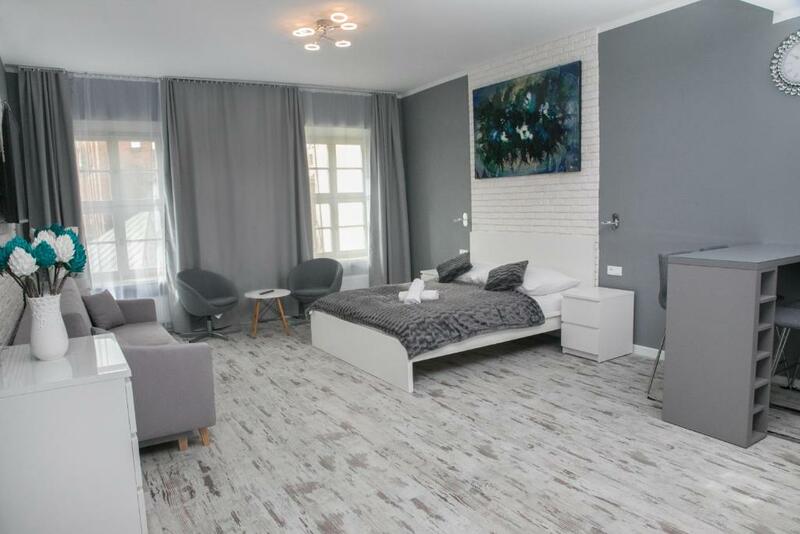 Apartamenty Mikołajska 5 to 12 klasycznie urządzonych apartamentów w nowoczesnym stylu. Mieszczą się one w odrestaurowanym, zabytkowym budynku i roztacza się z nich widok na dziedziniec lub średniowieczne uliczki Starego Miasta. W każdym apartamencie znajduje się łazienka z prysznicem i telewizor, a w niektórych – aneks kuchenny z czajnikiem elektrycznym, tosterem oraz bezpłatną kawą i herbatą. Dla Gości przygotowano ponadto suszarkę do włosów i ręczniki. Dla naszych Gości oferujemy bezpłatne miejsce parkingowe w podziemnym garażu. W celu rezerwacji miejsca i ustalenia szczegółów, proszę kontaktować się telefonicznie z recepcją apartamentów. Zamek Królewski na Wawelu i zabytkową dzielnicę żydowską Kazimierz dzieli od obiektu Mikołajska 5 Apartments odpowiednio 850 metrów i 1 km. Odległość od dworca kolejowego Kraków Główny i centrum handlowego Galeria Krakowska wynosi 750 metrów. Obiekt Mikołajska 5 Apartments usytuowany jest w samym sercu Krakowa, zaledwie 150 metrów od Rynku Głównego z zabytkowymi Sukiennicami i Kościołem Mariackim. Zamek Królewski na Wawelu i zabytkową dzielnicę żydowską Kazimierz dzieli od obiektu Mikołajska 5 Apartments odpowiednio 850 metrów i 1 km. Odległość od dworca kolejowego Kraków Główny i centrum handlowego Galeria Krakowska wynosi 750 metrów. House Rules Mikołajska 5 Apartments takes special requests – add in the next step! Debit card Mikołajska 5 Apartments accepts these cards and reserves the right to temporarily hold an amount prior to arrival. Mikołajska 5 Apartments accepts these cards and reserves the right to temporarily hold an amount prior to arrival. Refundable key deposit of 50 PLN will be charged when checking-in. All requests for late arrival must be confirmed by the property. Please contact the property to arrange for key collection outside reception opening hours. Please note that check-in after 18:00 is possible only at One World Hostel at ul. Westerplatte 8/2-3. Close to the Old Town and comfy bed. Can be a little noisy outside when people gather from the bar below but other than that it’s a great place to stay. Only on the one occasion the hot water went off for about half an hour. The whole apartment was spacious and very modern I loved it, great location and even had a few music Chanels which I love when I’m getting dressed. Apartment was really nice;) location is great! We had a slight confusion locating the apartment, however the staff were very helpful and it all got sorted quickly. It was clean, tidy and had everything you need for a short stay. Location could not have been better, very central and lots of good food options close by. The entrance to the apartment. Our shower was blocked and flooded every time we had a shower, we told reception on the second day of our stay and someone only came up on the 3rd day after I had to mention it again. Loved the location and how easy it was to get around. Very easy access to a tour booking agent downstairs also. Room was an amazing size and very tidy/modern. Would definitely come back here again. The apartment was very modern, clean and spacious. Perfect location to the main market square. 2 minute walk away. Was a great location and everything you need was walking distance such as pubs, restaurants , attractions etc. And room was nice and clean, worth what you pay! The only thing we would have liked was a hand towel in the bathroom and another towel each. Loved everything. Apartment was beautiful and great location.